Southeast Asian cultures have a long history of highly ornate and intricate craftsmanship and arts. From the glittering and colorful temples of Hong Kong and Bangkok, to the intricately carved ruins of the city of Angkor Wat, it is easy to see the long history and value artistic expression holds; it is intricately woven into everyday life, past and present. The following is a brief report back from a 3-week trip to SE Asia, documenting the street art and graffiti art found in Hong Kong China, Siem Reap Cambodia, Phuket, Phi Phi, and Bangkok Thailand. Few other cities in the world compare to Hong Kong on its sheer size, beauty, and economic vibrancy. Classified as a “mega city,” Hong Kong currently has a population of over 7 million. It is a vertical and dense city, constrained by a natural urban growth boundary, surrounded by the sea and mountains. Its public transportation is world-class, whizzing you around from place to place, with wait times mostly less than 2 minutes. In 1997, sovereignty of Hong Kong was transferred to the China, ending over one and a half centuries of British rule. Hong Kong became a Special Administrative Region of China with a high degree of autonomy in all matters except foreign affairs and defense. In 2014, a student-led series of sit-in street protests, often called the Umbrella Revolution rocked the streets of Hong Kong and produced an impressive array of street art and graffiti campaigns. The protests began after the People's Congress issued a decision regarding proposed reforms to the Hong Kong electoral system. The decision was widely seen to be highly restrictive, and equivalent to the Chinese Communist Party's pre-screening of the candidates for the leader of Hong Kong. Searching online, in social media, and on the city streets of many of the central city neighborhoods, it is quickly apparent that the street art and graffiti art is mainly concentrated in one neighborhood, Sheung Wan. Sheung Wan is known for its famous Hollywood Road, the second road to be built and the first to be completed when the colony of Hong Kong was founded. Hollywood is lined with exquisite Asian antique dealers, galleries, and flea markets, this area also showcases a variety of public expression on its alleyway walls. The group HKwalls organized many of Hong Kong’s prominent murals throughout the city. Founded in 2014, HK Wall is a non-profit organization that aims to create opportunities for local and international artists to showcase their talent through street art and culture. HKwalls hold an annual street art festival during Hong Kong’s art month in March, as well as year-round programming that focuses on artist career building and arts awareness. The festival partners include Vans and Montana and have featured big-name street artists like Vhils, Peeta, Above, and Okuda. The 2016 festival focused on the Kowloon neighborhood or Sham Shui Po and included 40 artists from 17 different countries, painting 40 murals. 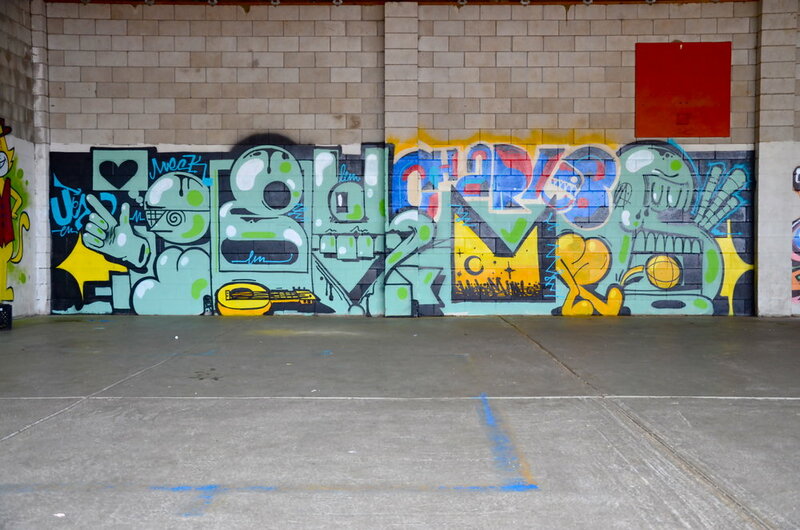 An impressive 42 workshops were also provided in March by HKwalls and House of Vans. There is also a strong stencil scene with several artists seemingly at work. Unlike other cities, there doesn’t seem to be as much tagging occurring, and surprisingly little obvious evidence of buff. Perhaps this is due to the more conservative culture, or the fact that one neighborhood is concentrating the art, so people know that painting there will likely produce more lasting pieces. Siem Reap is Cambodia’s second largest city with a population a little over 200 thousand. It is the gateway “resort town” for visitors seeking to explore the ancient ruins of Angkor Wat. Angkor Wat is the largest religious monument in the world, with the site measuring over 400 acres. It was originally constructed as a Hindu temple of god Vishnu for the Khmer Empire, and gradually transformed into a Buddhist temple toward the end of the 12th century. Siem Reap is an emerging economy based mainly on tourism and has a large number of NGOs and other not-for profits organizations. Torn apart by war, famine, and still plagued with the horrific situation of landmines, Cambodia is a diamond in the rough, a city home to some of the kindness and strongest people. Siem Reap did not have what you would traditional call street art or murals, but it did have a moderate amount of random graffiti, some of which was done by visitors. The worldwide graffiti culture has seemingly not reached Siem Reap yet. With no evidence of buffing, the existing graffiti appeared in alleyways off main streets, easily spotted by the prominent mode of transportation, a Tuk Tuk or motorbike. Surprisingly at least two bars embraced a graffiti art theme, one of which even had a full half-pipe on the roof, proudly proclaiming “Cambodia” in bold wildstyle graffiti lettering. This bar is certainly a hotspot for both locals and visitors alike with 50-cent beers, live music, skateboarding, and pool tables. The islands of Phuket and Phi Phi are home to some of the most pristine and exotic natural landscapes on the planet. Phuket is the hub, often just a stopping off place for island hopping, but if you stay a few days and visit the older parts of town, it is clear that it is home to a vibrant creative scene. The beautiful old Sino-Portuguese architecture in Phuket’s Old Town is burst with exquisite island colors. Phuket has several art galleries, local craft fairs, including a weekend Indy Market featuring local artisan goods, resale clothes, a variety of food and beer vendors, and live music, a cultural hot spot for island youth and tourists. Phuket is not that big, so you can pretty easy wander around and find a lot of great street art fairly easily. General roads to transverse are Phang Nga, Thalang, and Ranong. A great guide and map can be found on this blog. The city also has an urban arts initiative called F.A.T. Phuket (Food Art Old Town), that has organized 12 large-scale mural paintings, based on local food, culture and customs. Started in mid-2016, this initiative was between a well-known property developer and a local artist. Local artists and some of Thailand’s most famous street artists quite literally canvassed the streets and murals started popping up all over the place. To see murals of this size and quality in a town the size of Phuket is a delightful surprise. Rising above its busting markets and perfectly playing with its textured walls, bold street art has certainly made its mark on this city. While tourists’ flock to these sites to take photos, not everyone on the island appreciates the new style of art appearing on the walls. Some of So Phuket’s murals in the historic Old Town District have stirred up controversy amongst more traditional locals. Newspaper articles covered the situation, even conducting a public opinion polls to find out what people felt about and wanted to see happen with the new art. One mural by famed Bangkok artist AlexFace was eventually buffed based the public survey. On the small island of Phi Phi off the coast of Phuket, the central part of the island is notorious for its backpacking and party scene. Here you will find an impressive sticker art display on many of the poles and pathways. There are no cars or motorbikes on the island, making it very pedestrian friendly and localized. 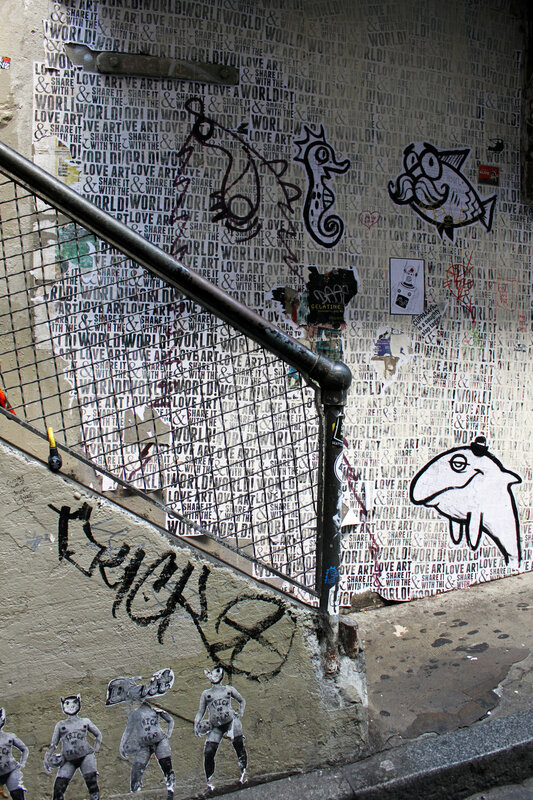 Although there are not any large-scale murals here, graffiti can be found in the alleyways (like at tattoo shops) and along popular tourist hiking pathways. The sprawling metropolis of Bangkok is home to over 6 million people, with the official city limits covering over 600 square miles. Bangkok is an extreme example of a “primate city,” because its huge population significantly dwarfs Thailand's other urban centers. Stretching along the Chao Phraya River, this was a central port city, between the ancient eastern and western worlds. Bangkok’s urban development has allowed for many of the older buildings and sections of town to remain. Expanding over such distances, locals and tourists mainly rely on cars, taxis and tuk tuks to get around, as Bangkok’s public transit system is still in its infancy. Bangkok is famous for its food, with an amazing array of street vendors and restaurants serving up some of the most tantalizing and complex flavors; all with 5-star quality for ½-star price. Bangkok had an impressive array of high-quality mural work, along with local street art and a very active graffiti scene. Walking over 50 miles in 3 days, finding street art in Bangkok proved to be a bit more than in some cities. 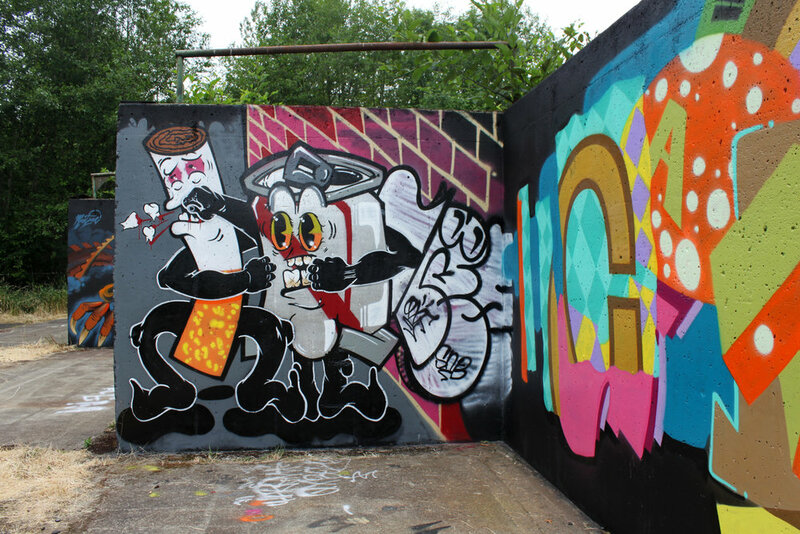 Impressive pockets of graffiti art can often be found along the cities many canals. While graffiti art is spread throughout the city, the Saen Saep Canal, Charoen Krung Road, Bang Rak, and Klong San were particular hot spots in 2017. In the quiet residential enclave of Talad Noi, Trok San Chao Rong Kueak alleyway is known for its historic folk art. In the meandering alleys and passageways, you will find interesting examples of local art, amongst these well used communal public spaces. The Bangkok Art & Culture Centre (BACC) is a contemporary arts facility in mid-town. BACC aims to create a meeting place for artists, to provide cultural programs for the community, giving importance to cultural continuity from past to contemporary. It aims to open new grounds for cultural dialogue, networking, and create new cultural resources from both the public and the private sectors. To do this they provide programs for art, music, theatre, film, design, and cultural/educational. What is particularly unique about BACC, is that the facility also houses multiple museums, local pop-up stores (think Tender Loving Empire), artist studios, spray-paint distributors, coffee shops, restaurants, art bookstores and public libraries. BACC provides an amazing hub for artists and the larger community. Founded in 2013, the BUKRUK Urban Art Festival has organized many of the larger scale murals on Bangkok’s walls, hosting art by international artists such as Nychos, Aryz, and ROA. The first edition gathered successfully 30 artists from Thailand and Europe, bringing artists from over 10 countries together to paint. This 10-day project features murals, art exhibits, artist talks, animations, music festivals, , mapping projections and workshops. Interestingly each year focus on partnerships with particular parts of the world. For example, in 2013 the festival focuses on Thai-Europe. In 2016, it boarded to Asia-Europe connections. While cities in places like the United States would likely never fully embrace a rough park like this as an official city park, it does offer an excellent example of DIY style tactical urbanism and the intrinsic power of allowing for art to create vibrant cultural spaces that everyone with an open-mind and common-sense can safely enjoy. 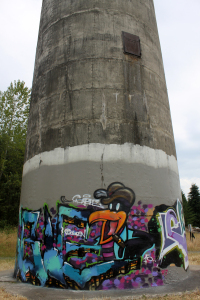 Graffiti art is probably not the first thing that crosses a person’s mind when they think of Onalaska, Washington. Situated halfway between Portland and Seattle, Onalaska is an unlikely location to hold one of the largest aerosol art events, the Annual Northwest Spray Day; a regional live painting event that since 2014 has been bringing together and showcasing of some of the best graffiti art talent in the Pacific Northwest. Every June artists from as far as Oakland to Vancouver, B.C. 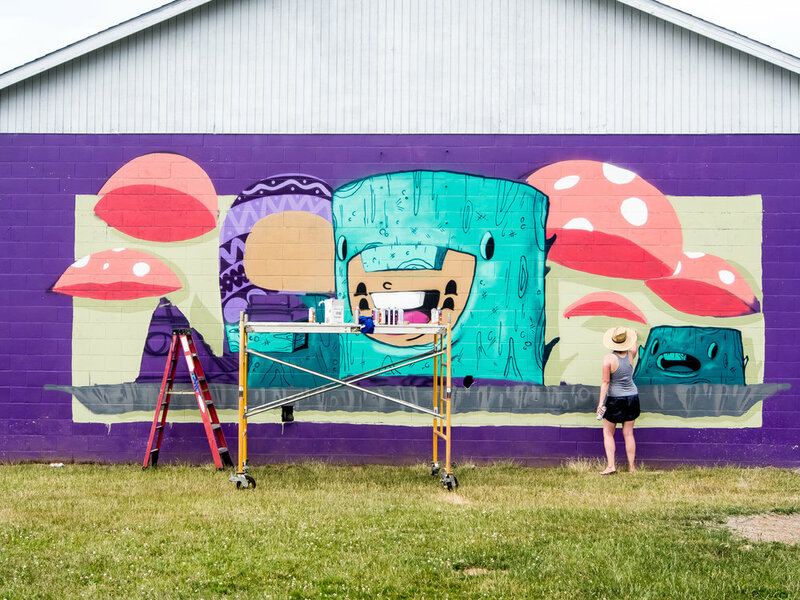 gather to create their aerosol-based artwork at three sites scattered around the small town: the abandoned waste transfer station, the old 300 foot-tall Carlisle Lumber Mill smokestack, and the Onalaska Middle School basketball playshed – a space totaling over 3,000 square feet. Justin Boggs, the event organizer and once-Onalaska native, secured space around the small town from several local governmental and non-profit entities, raised money, and networked within his community to make this happen. 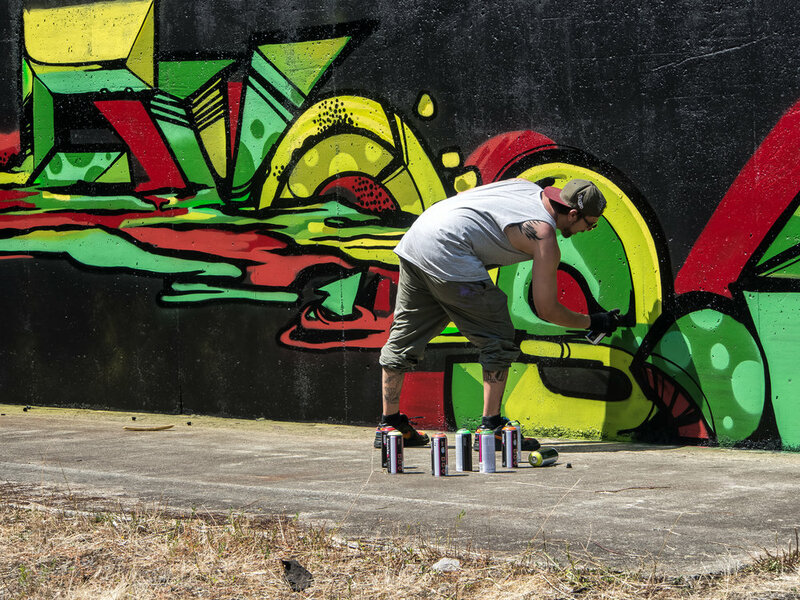 He, along with several other graffiti artists and supporters, turned the once abandoned, dull, and un-notable structures into colorful, energized spaces marked with distinct personality. Boggs and his family also did a lot of community outreach to raise money, even securing art donations to auction off. This year, Boggs parents even donated $1000 to the event; Boggs explained, “It wouldn’t happen without their support.” Boggs got permission from the Onalaska Volunteer Fire Department and Lewis County Public Works to access the main Spray Day venue, the abandoned transfer station. Local paint distributors Jerry’s Color Center and Rodda paint each donated 20 gallons of primer. Spray paint sponsorship comes from Silika Store (in Tacoma) and Ironlak. 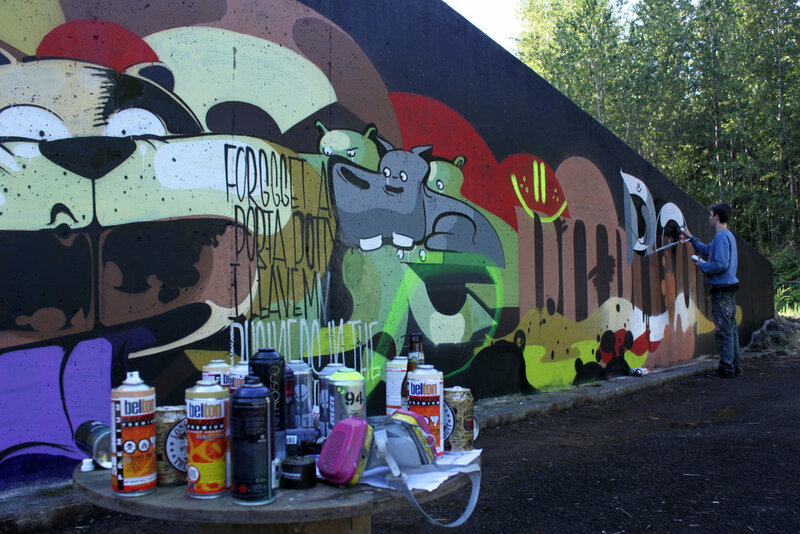 Boggs, now student at the University of Oregon in Eugene, described the main goals of NWSD as a way of bringing together and networking the best spray paint talent in the Pacific Northwest. He also wants to bring vibrant public art to his rural hometown community. “It’s a unique celebration of graffiti art that helps regional artists gain exposure within the global graffiti community. There’s also something special about the atmosphere of so many talented artists gathering in one place during one day and painting all at the same time next to each other. It produces a higher quality of work,” explained Boggs. Amidst the sound of rattling and hissing aerosol cans, non-stop hip hop beats, and sizzling BBQ, graffiti artists took center stage, painting their unique characters and stylized monikers in an impressive array of styles and techniques. 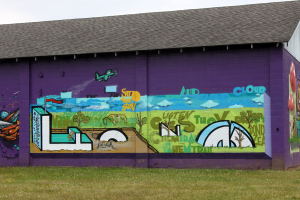 The basketball court play shed at Onalaska Middle School is the largest of the three painting locations, displaying 12-15 individual pieces of graffiti art each year. Local parents, children, and students visit the event throughout the day to watch the artists transform the structure’s formerly blank aesthetics into something quite notable. Many onlookers seemed to appreciate and admire the efforts of these local and visiting artists. They not only helped bring the community together for this event, but they also provided kids with positive examples of how transformative this style of art can be if you put your mind to it (and ask for permission). It takes a lot of time, skill, and diligence to master the medium of aerosol. In a time when the school’s art programs have been cut due to budget constraints, this town needs all the positive art outlets it can get. Overall, Spray Day was a community effort, big and small. Graffiti artists throughout the region worked together to provide an outlet for their craft, a legitimate modern art form that’s still sometimes feared, repressed, and regulated in nearby cities like Portland and Seattle. On a smaller, but no less significant scale, Boggs and other local organizers, were able to give a special gift to their hometown, one that’s plagued with boredom and poverty. They were able to bring these spaces to life in a style that they and the town’s youth can connect and identify with. The art not only brightened up the often grey and rainy town, it also sparked imagination and interest throughout the region. 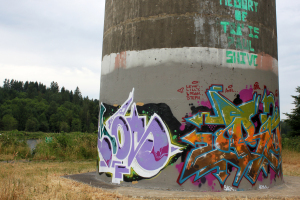 A random town off I-5 is now a Cascadian graffiti art landmark. Next year, Boggs is considering changing the location of Spray Day, bringing this gift of art to another deserving site. As with graffiti, there’s always the urge to go bigger and better. ‘What is a festival? It’s something exceptional, something out of the ordinary . . . something that must create a special atmosphere which stems not only from the quality of the art and the production, but from the countryside, the ambience of a city and the traditions . . . of a region (de Rougement, quoted in Isar, 1976). Beginning in the early late 1990s and early 2000s, a new contemporary art movement began sweeping the globe, this time transgressing the walls of the gallery and museum and resided primarily in the streets. Some modern cities are transforming into free public art galleries, showcasing talent from near and far. It has been said that street art is one of the most influential art movements of recent history. With roots in graffiti culture, pop art, and community muralism, contemporary street art is the current culmination of global communities coming together in time and space. These festivals have a way of producing both a mass spectacle of new art splashing onto millions via social media. On the ground, festivalgoers get a temporary glimpse into public spaces that have no bounds, where a carnivalesque atmosphere allow people the freedom to gather and use the streets for expression of all kinds. Festivals play an important role in countering the social and homogenizing crises faced by cities in the context of globalization. The growing interest in festivity and street art is partly a grassroots reaction and strategy to combat the growing alienation and insecurity we feel in increasingly commercialized, militarized and bureaucratically-controlled public spaces. A new generation of artists, organizers, and activists see the city as their canvas and message board. In many modern cities, the urban landscape provides endless amounts of blank indeterminate spaces. These are canvases in the eyes of many, and are a striking and accessible context for their art and message. 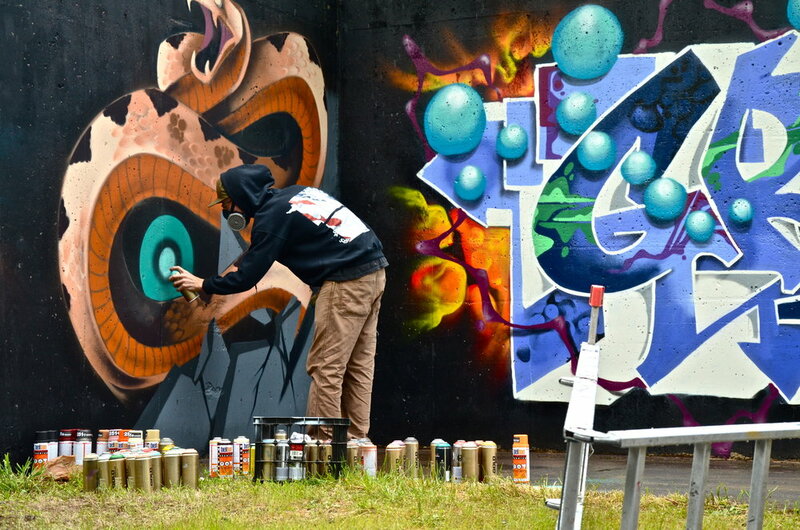 Large multi-year street art festivals are now happening in cities around the world. This proliferation and resilience is evidence that these festivals have some use-value in society, for social-bonding, place-making, or place-marketing. The following research is the culmination of several years of visiting street art festivals across in the U.S, including some of the largest and most well-known street art festivals in the U.S. like POW! WOW! (Honolulu, Tawian, Austin), Art Basel (Miami, Basel, Hong Kong), Bushwick Open Studios (New York City), and Forest for the Trees (Portland, Oregon). We actively experienced and participated in these festivals in multiple roles, from mere spectators and party-goers to managing paintings and tours. This multi-level engagement gave us unique first-hand glimpses into the festivals intricacies, similarities, and differences in their organization, styles, and impact on people and places. During these festivals, local and visiting artists collaborate on public art murals and interventions. For artists, they benefit not only from the exposure, but also by participating in gallery exhibitions, lectures, workshops, and panel discussions. Public engagement is a key component of these festivals as organizers attempt to create welcoming spaces and opportunities where the community can interact, network, and learn from artists. Logistically, these festivals take an immense amount of time, effort, and money to orchestrate. Some festivals are run by city governments, or arts commissions, but many, and we argue the best, are run by a dedicated group of local citizens and small business owners who are active in the arts community of their cities. Regardless of their position, festival organizers spend up to a year planning for a week-long event. Relationships with local business and property owners must be nurtured to secure ample wall space and to find spaces to host events. Sponsorship must be secured from city governments, crowd-funding, and corporations. There is also the logistics of providing paint, lifts, and supplies to muralists. Differences between these festivals are seen in the way they are founded, who the organizers are, and how they are operated. POW! WOW! is a more localized festival, started by a group of artists based atLana Lane Studios. All the murals are located in the Kaka’ako warehouse and manufacturing district where Lana Lane Studios is located. Founder and director of POW! WOW! Hawaii describes what he has created over the past 5 years as a “global network of artists and organizes gallery shows, lecture series, schools for art and music, mural projects.” This weeklong event is managed by seven directors, and includes over 100 visiting and local visual artists, and countless documenters and festivalgoers. Each artist is sent photographs of the available walls and asked to pick their top five location choices. Event coordinators then try to match artists with appropriate walls that they have been working to secure all year. With now increasingly limited wall space in the Kaka’ako district of Honolulu, some older murals are buffed to make way for new murals, other times artists are paired together to share a wall and form impromptu artistic collaborations. Local graffiti crews and street artists are also invited to participate in the festival and are provided wall space to showcase their talent. What is particularly unique about Pow Wow, is that upon arrival the artists are provided “cultural tours,” so they can consider setting, place, and cultural history when creating the work they put on the streets of Honolulu. 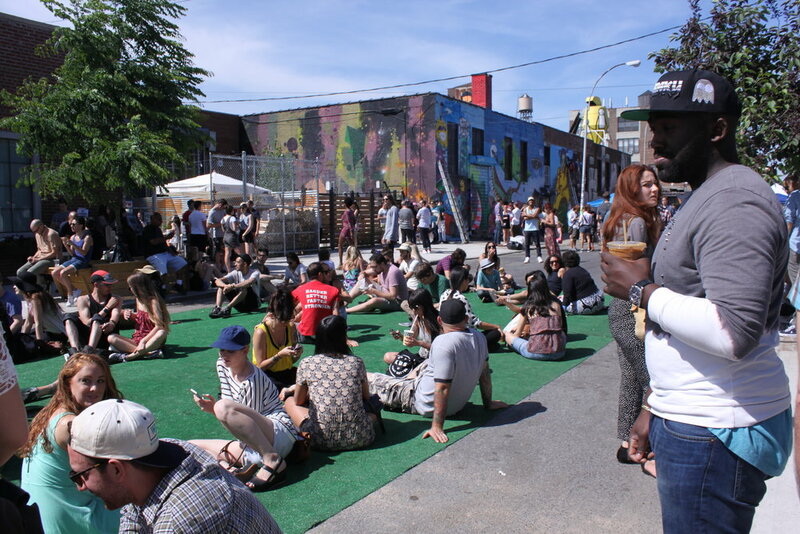 Bushwick Open Studios describes itself as a “volunteer, non-hierarchical organization” with “a completely open structure.” Anyone in the community who is willing to volunteer their time is welcome to join and take on a leadership role. 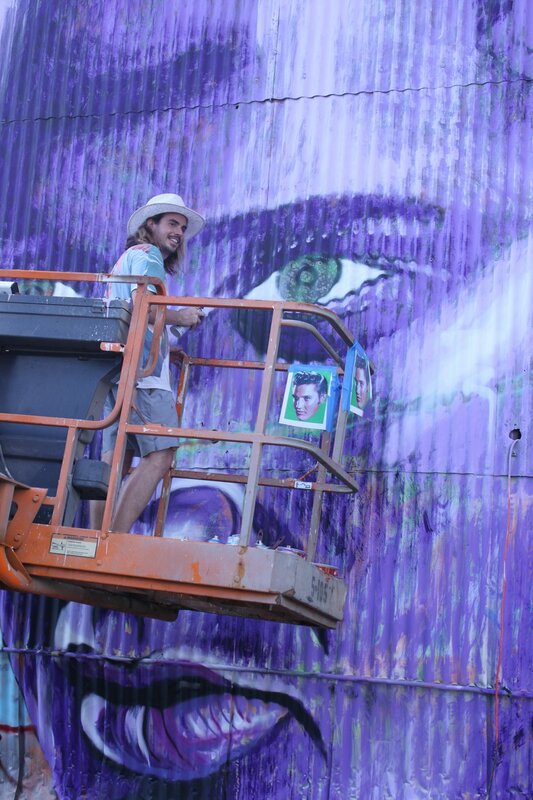 Artists who want to paint can arrange a mural with neighborhood property owner as they normally would. Artist living and working in Bushwick open their studios up to visitors hosting gallery shows and parties. A few blocks are closed to traffic, turf is laid, bands play, and food carts serve up local specialties. Comparatively, POW! WOW! and Forest for the Trees are more centralized and planned out by a single entity. The Forest for the Trees (FFTT) public art project was founded and is directed by a local artist and gallery curator. FFTT murals are spread throughout the City of Portland, rather than being concentrated into one district. Several large-scale murals are located downtown, but the majority are located along the main drags of Portland’s five districts. 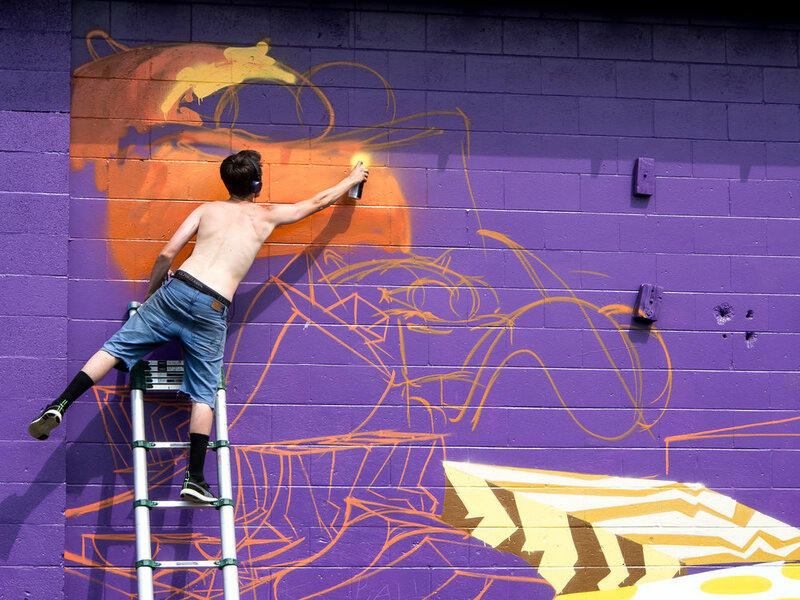 In 2014, 23 artists from Portland and around the world paint over 20 walls. The event, now in its second year, assigns twenty artists, half of them regional, to locations throughout Portland. The results are site-specific, significant-scale murals painted in a variety of styles and palettes on sixteen buildings in mainly close-in neighborhoods about the city. Said to be the first large-scale art festivals of its kind (started in 1970), Art Basel Miami exhibits more decentralized management, being part of a larger event that focuses on gallery art. Murals are mainly organized by several art galleries, property owners, and developers working in tandem. Like POW! WOW!, Art Basel is centered in one area, the Wynwood Arts District. 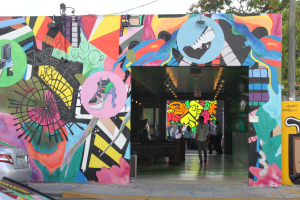 Wynwood was a consorted effort started by developers who redeveloped warehouses, factories, and unused buildings into art complexes, galleries, restaurants, cafes, and other creative businesses. Broad local outreach is an important factor in planning these festivals. It is easy for international festivals like these to be criticized for ignoring or outdoing local talent. At POW! WOW! 2014, several indicators of resistance were documented including mural tagging and pasted protest flyers. In Bushwick, it took the form of stenciled sidewalk messages. 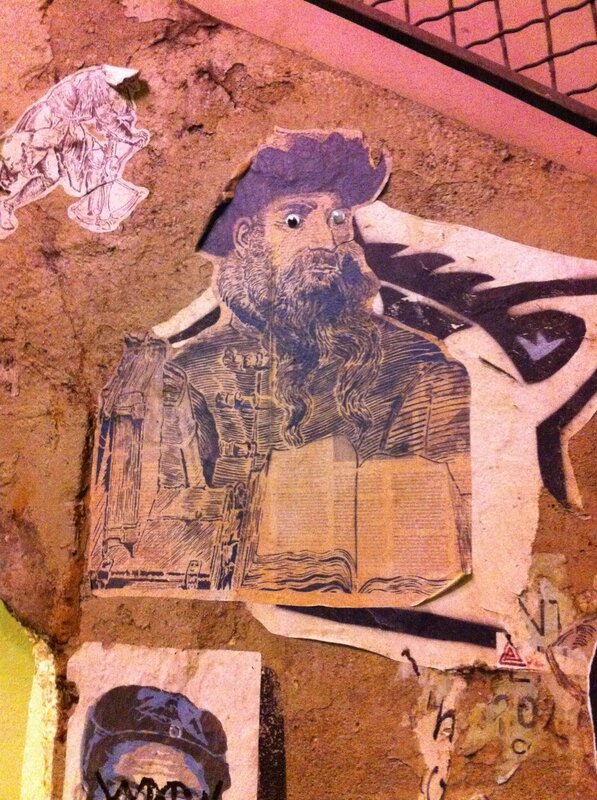 For every mural, however, there are countless unauthorized graffiti interventions. Artists who visit might do an official piece on one corner and a few blocks away do an un-commissioned piece. The juxtaposition of planned and spontaneity adds to the allure of these events for spectators. Generally, business owners allow this activity to happen during the festival (after all many of them are benefiting from the foot-traffic and tourism) but like after Art Basel, many buff and remove it after the event is over. For the viewer, it is fascinating to watch the process of mural making unfold day after day. Each artist has their own unique style, method, and approach. Some use only aerosol, others use a combination of aerosol for fill and brush for detail, others use rollers, mittens, chisels, and hammers. Seeing a piece jump from a black-book to a wall, outlined, filled in, rendered, and detailed is an exciting journey into the artists’ craft and personality. Some work quickly, others take a slower pace. Some rise with the sun, others paint through the night. Everyone however must work with what is given to them, adjusting their artistic visions to fit the walls and contours of the space. Artists benefit from these festivals by being provided spaces to showcase their work to new audiences in other cities. There is an influx of new ideas and styles into the city’s art scene. Cultural exchanges are made, as artists learn to work together, blend styles, sometimes without even speaking a common language. The result is entirely new forms of art that would have otherwise never have happened. Forest for the Trees specifically aims to create a mix of traditional street artists, those with backgrounds in graffiti-style, and even fine, sculptural, and graphic art. Artists are provided opportunities to meet, reconnect, and network with other visual artists from around the world. Introductions are made, and cards and stickers are swapped. Convergences like these provide a platform for sharing ideas and building new partnerships. Although social media has provided an amazing platform for connecting with others, face-to-face interaction often offers the possibility of forming stronger more lasting relationships than those based solely online. These types of ‘meeting grounds’ are where new cultural movements form, solidify, and evolve. Another benefit of organized art festivals is that sometimes it is difficult to get walls in cities where one does not physically live, or have connections to. Having someone on-the-ground helping visiting artists secure wall space is essential, especially in a city like Portland where having the permission of a property owner is not enough – all murals also need a city permit (or RACC wavier). Attaining a city permit is a month-long process that requires someone applying, paying a $50 fee, posting a mural notice, and holding a community meeting all things that are difficult or impossible to do remotely. Street art and festivals can also positively impact surrounding businesses and drive local tourism. They call attention to now unique places and make people want to get out of their cars, walk around, and enjoy the streets. Traditional art hubs like New York City, Paris, Berlin, London, Sao Paulo, and more recently, Detroit and New Orleans, are becoming destinations for creative-types and art connoisseurs. Finally, and perhaps most importantly, these events provide a way for the general public to engage in the process of public art making. Public art is a democratic form of art. People do not have to pay to go to a museum, or feel uncomfortable going to a fine art gallery to see amazing modern art; they just have to explore and walk the streets of their city. Organizers’ use of social media to promote, inform, and connect with their audiences. In addition to informational webpages, interactive maps, and press releases, these festivals use platforms such as Instagram, Twitter, and Facebook to notify the public of events, locations, and opportunities. POW! WOW! offers free lectures and classes on various topics during the festival, and in 2014, Portland Street Art Alliance partnered with Forest of the Trees to offer a guided bicycle tour to help the public engage with the muralists and the new exciting spaces being created. Moving art from the studio and canvas, and into city streets, has a powerful effect on people and places. Concentrated public artistic interventions like these street art festivals can dramatically transform landscapes, uses, and compositions of cities. Making public art is a bold statement and a powerful tool. Street art festivals distill creative energy into one space and time, and have an everlasting ripple effect on the people and cities. This global movement is inspiring people to re-energize their public realms, one wall, one space, and one conversation at a time. The global street art communities converge at these festivals to create a more inspiring streetscape. A truly exceptional break from the ordinary, a certain time when people celebrate in the public sphere, art runs freely through the streets, and life springs up out of the cracks of the city streets. More photos from POW! WOW! 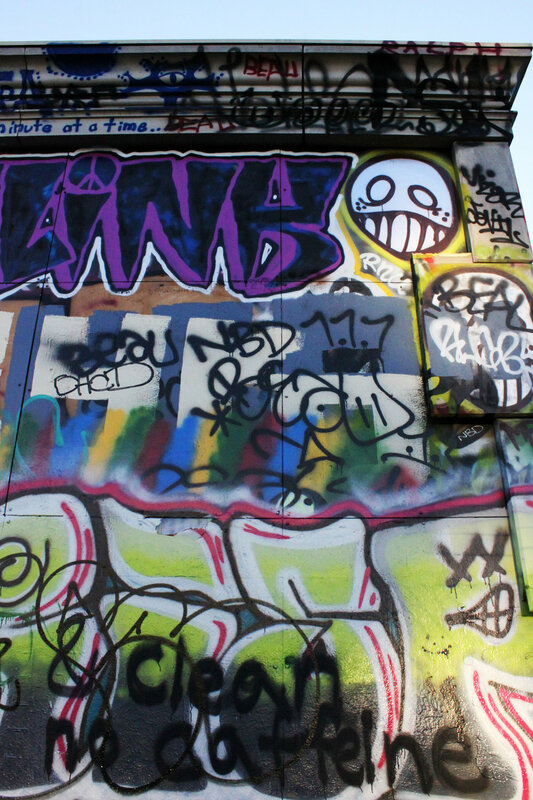 The City of Seattle manages graffiti reporting, abatement, and removal primarily through the Graffiti Prevention Program housed within Seattle Public Utilities. 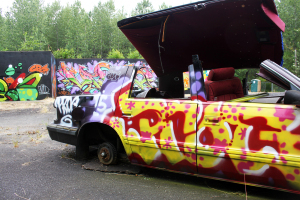 Seattle’s Graffiti Nuisance Ordinance was adopted in 1994 and requires property owners to remove graffiti within 10 days of a report, or the property owner will receive a notice of civil violation and directed to appear before the City's Hearing Examiner. The Hearing Examiner can fine the property owner up to $100 per day (with a maximum of $5,000) if the graffiti is not removed. 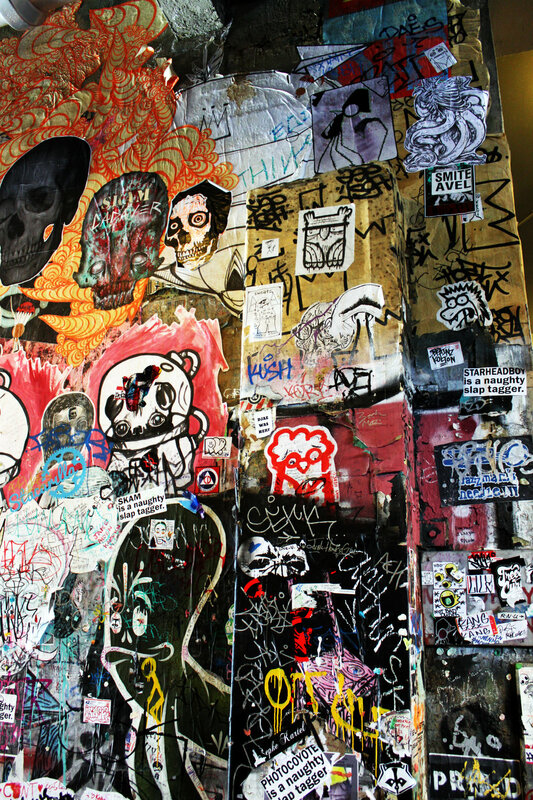 Like many cities, Seattle has a 24-hour Graffiti Report Line and online reporting system. 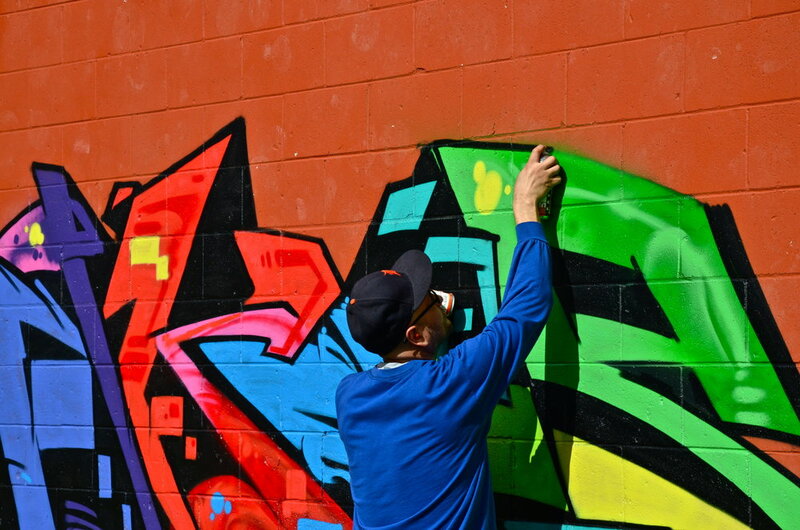 Additionally, the City’s Adopt-a-Street program organizes volunteers to participate in “Paint Outs,” which are periodic community graffiti removal events. In 2009 (the last publically reported statistic), the City of Seattle spent $1.8 million. Additionally, the King County Metro Transit that spent another $734,000 in 2009 removing graffiti from transit property. 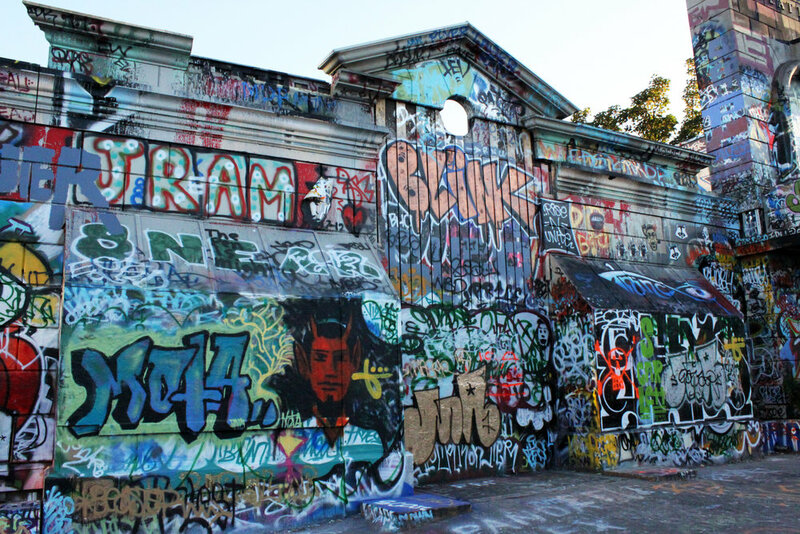 In 2009, at the request of City Council, the City conducted a research study to examine how the City handles graffiti removal, prosecutes offenders, and educates the public about graffiti. Part of this research was a web survey conducted with 900 Seattle residents, businesses and organizations. Surveys of this type about the public’s perceptions and opinions of graffiti are rare. The survey found that public views on graffiti are mixed, with 49% saying that graffiti was “a medium to very big problem,” 21% saying it was “a small problem,” and 39% saying graffiti was “not a problem” at all. This graffiti report made nine recommendations to the City. Adding “stickering” as a form of graffiti was at the top of that list. In response to this recommendation, the advocacy community group Graffiti Defense Coalition was formed. These activists fought against the adaptation of this new policy and successfully blocked the addition of stickers into the graffiti code. Read more about the community's reaction to this report here. Another report recommendation was to hire a dedicated police detective to apprehend and prosecute graffiti offenders as part of a two-year pilot project. This recommendation resulted in the hiring of Christopher Young in 2011, who continues to work as Seattle’s sole graffiti detective in 2016. Interestingly, Detective Young also runs the website Graffipedia.org, which aims to be “a training aid for other graffiti investigators.” On this website, Young reports that in 2012 there were 181 identified graffiti suspects in Seattle, of which 71% were adults, with an average age of 23. 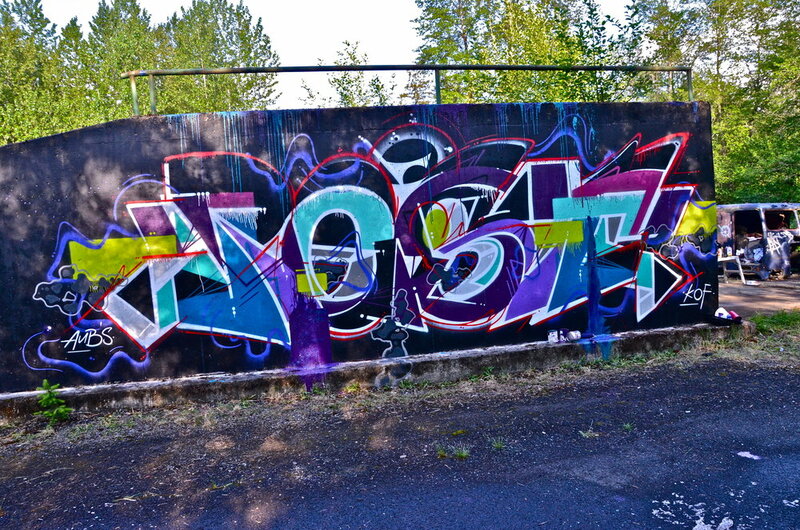 Young also reported that only 1% of graffiti in Seattle is gang-related. This statistic suggests that association between graffiti and gangs is a myth, and the fear that they public has that graffiti is a signal of criminal activity in a neighborhood is unfounded. This is also perplexingly quite lower than 12-15% of gang-related graffiti reported in Portland. Seattle is a much larger city, so you would expect that it has more gang activity than Portland. This dramatic difference calls into question the methodology used to track and report graffiti statistics, which is not systematic or disclosed. 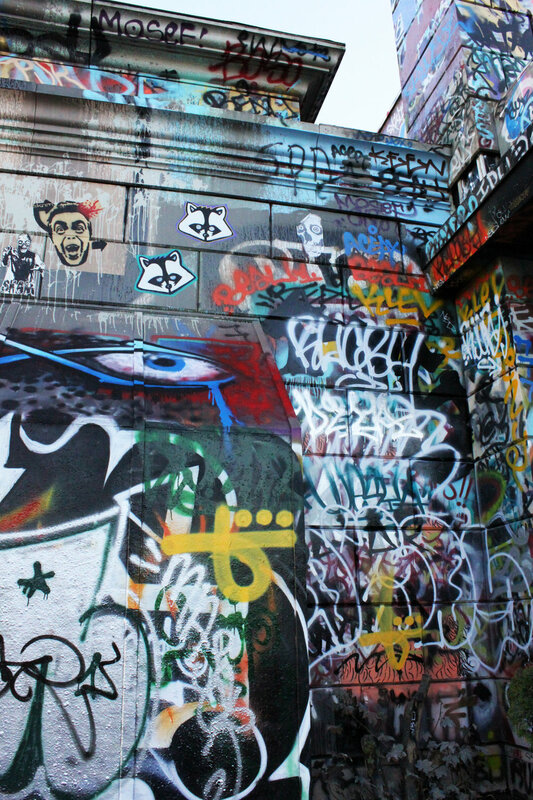 The City also conducted a systematic, single-day, physical count of graffiti in four sample areas in two Seattle neighborhoods and documented 556 instances of graffiti including 551 common tags (five of which appeared to be gang-related). It was found that public property was nearly twice as commonly tagged as private property, with traffic/street signs, utility poles, and pay stations as common targets. 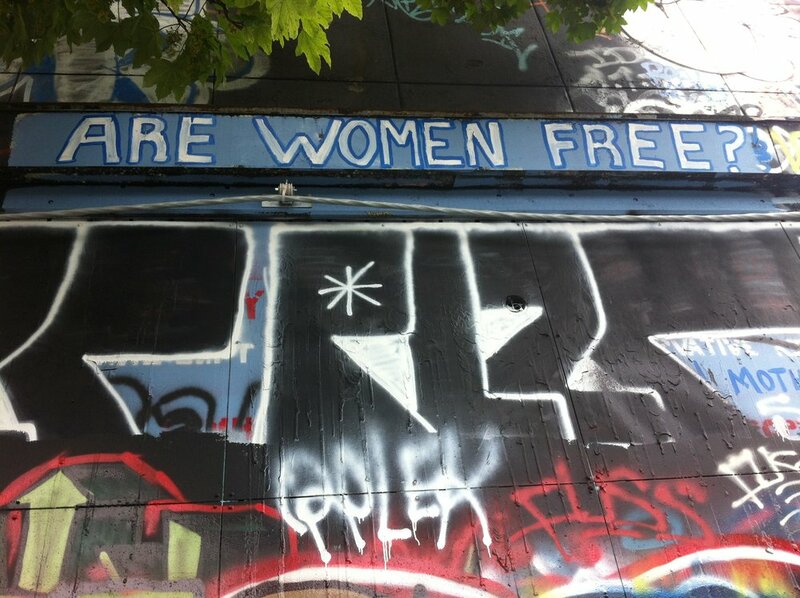 Seattle is famous for its free spaces for graffiti and wheatpastes. The Pike Place Public Market Historic District is a distinctive collection of early twentieth century commercial buildings and public spaces that have evolved and functioned as a vibrant public space since August 1907. For over 100 years, this labyrinthine of angled streets and steep grades has maintained a distinctive physical and cultural character. 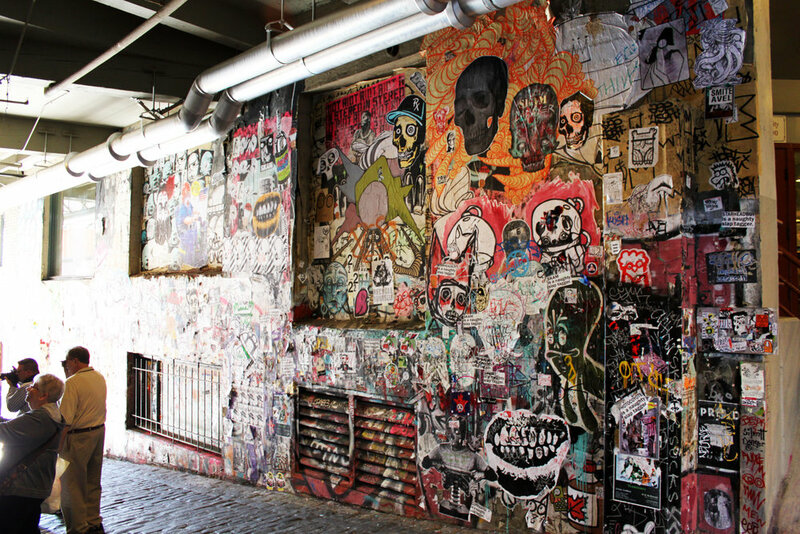 One of the main points of interest of Pike Place, for both locals and visitors alike is Post Alley, named for the Seattle Post, which used to be located at the alley's southern end. 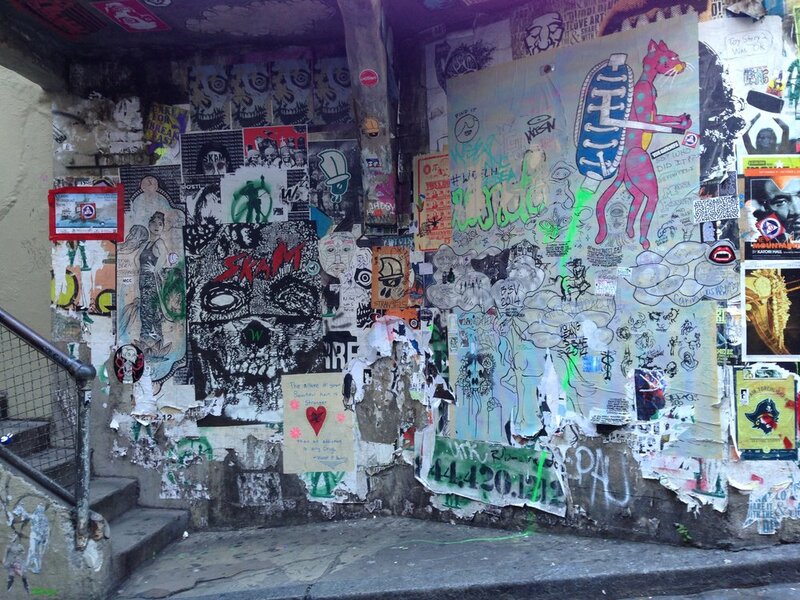 This narrow alley passage is famous for its gum and wheatpaste art wall. The gum tradition began in 1993 by patrons of a nearby theatre. It is unclear how long the wheatpaste art wall has existed (please email PSAA if you have data on this history), but it's past is likely intertwined with the historic tradition of pasted city notices and advertisements, especially considering this is a high-traffic corridor once occupied by a newsprint company. With both the gum and wheatpastes, the Pike Place Market management and the City of Seattle police takes a “hands off” approach to these public interventions, allowing and even somewhat encouraging freedom of speech and expression in these spaces (likely due to the obvious tourist-draw). Over the years, the gum has spread quite a bit. So much so local street artists have attempted to clean the gum off the art side of the alley, even spraying stenciled signs saying to please not to put gum on this side of the wall, but to no avail. Even though the City of Seattle's sanitary department cleans off some of the gum bi-monthly, in 2015, they undertook a multi-day process of completely cleaning off both walls. 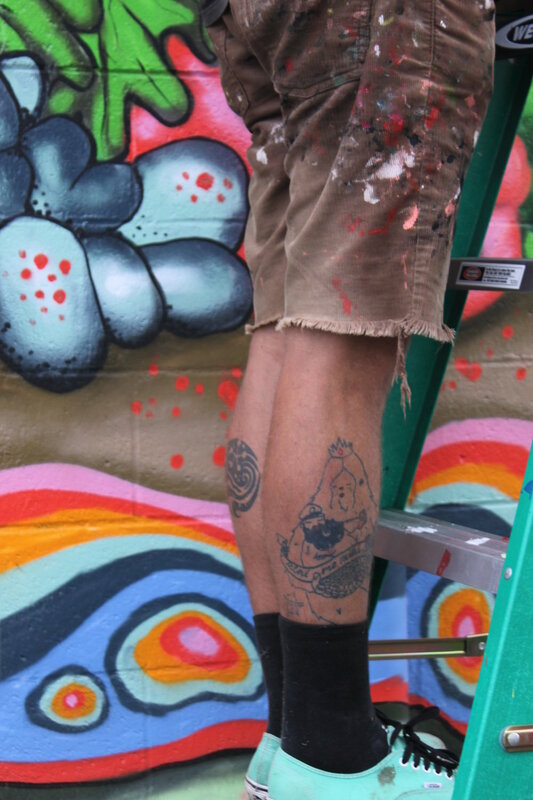 Within hours of being clean the gum started to re-appear and artists from all over the pacific northwest descended upon the alley to reclaim the art space with their wheatpastes. For the foreseeable future, Post Alley is one of the United States most open and accessible public art spaces. 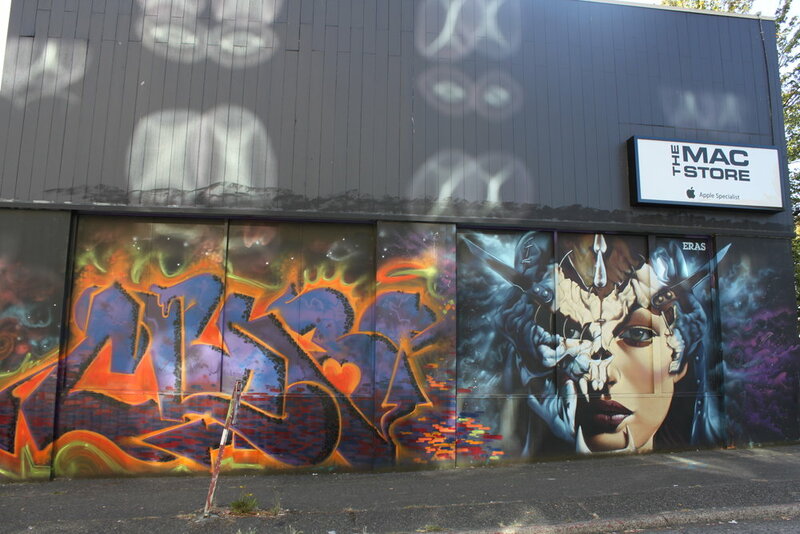 Since the 2010 report, alot has changed in the Seattle street art graffiti art scenes. SEATTLE HAS BEEN THE HOME OF AMAZING ARTISTS FOR SOME TIME, BUT UNTIL RECENT YEARS THE SKYLINE HAS LACKED THE TYPE OF LARGE SCALE MURALS THAT LANDMARK OTHER CITIES OF CULTURE AROUND THE WORLD. SEVERAL ORGANIZATIONS AND PROJECTS HAVE WORKED TOGETHER TO CHANGE THAT. Urban Artworks is a Seattle-based 501(c)(3) nonprofit organization that provides opportunities for contemporary artists and local youth to work together to create public works of art. Since 1995, they have collaborated with more than 2,000 youth to bring art to public and private spaces throughout Seattle neighborhoods. They have organized murals by internationally renounded artists such as Insa, Erik Burke, and Devin Liston and local Seattle-based artists such as Mary Iverson, John Sarkis and Kyle Martz. You can find their murals all around the city. They are also well-known for their successful utlity singal box project in along Broadway and in Fremont. In 2014, the Seattle Mural Project brought murals by NoseGo and Ellen Picken to Seattle to paint as part of this city-sponsored project. This mural project was locally managed by the founders of the Graffiti Defense Coalition, a grassroots organization working for policy that supports street art. 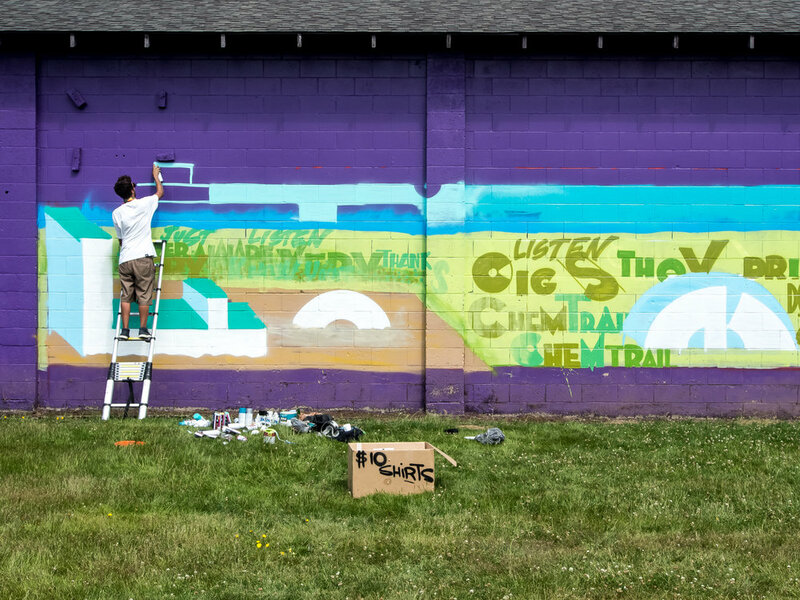 The SODO Track, which runs along the public transit corridor is a unique mural project that asks artists to explore one theme side by side – motion, speed, progression – to reflect the experience of its viewers. Artists from Seattle and around the country, together with international talent are painting large-scale murals to mark the portal to Downtown Seattle as an imaginative raceway of art in motion. The team making this happen includes 4Culture, Gage Hamilton (director of Portland's Forest for the Trees project), SODO BIA, and Urban Artworks. For 7 years, the former 104-year old building known as TUBS sat vacant at the corner of 50th and Roosevelt in the University District, amids a bustling urban neighborhood. In 2009, the building owner thought it's demise was near, so they invited graffiti artists to use the 12,000-square-foot space as a canvas for their art and expression in the meantime. The owner wanting to provide the community an "ephemeral and evolving" piece of curated street art. Over time, the space opened up even more to other artists, and it essentially became a free wall and a hot spot for Seattle graffiti. 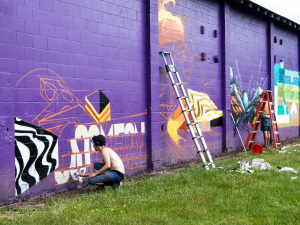 A year after the free wall began, the City had receive over 900 graffiti complaints. But the building owner fought back, citing their private property rights and community appreciation for the art. By this point, TUBS had become a tourist destination and like many graffiti meccas, served as an urban backdrop for photographers and filmmakers. In response to the complaints, the City of Seattle said they're hands were tied and they had no power to force the owner to clean up their building. Seattle City Attorney Ed McKenna said, "Legally, we're in a difficult position. We can't force the owner to remove his graffiti, so we have pretty much have exhausted every remedy." The City of Seattle defines graffiti as "unauthorized markings." 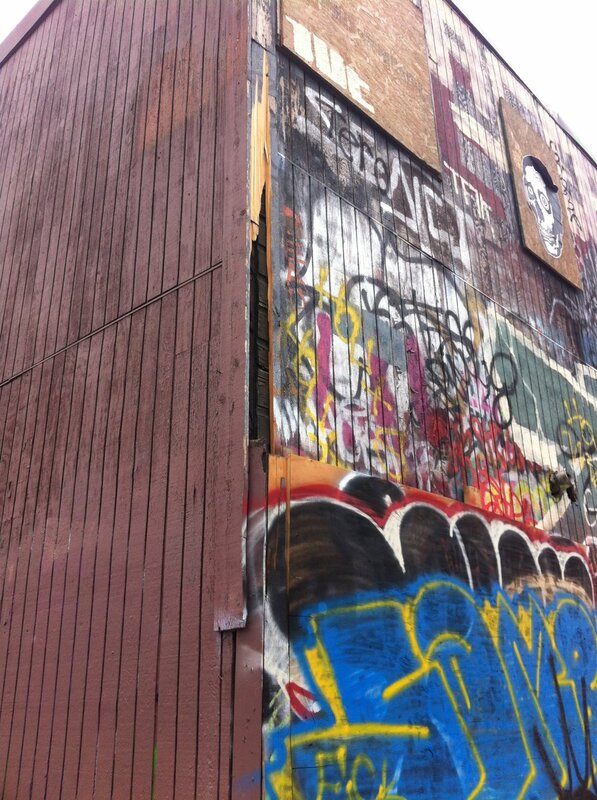 The difference with TUBS was that the building owner willingly allowed their building to become a "free wall," so the City of Seattle could not fine or penalize them for graffiti. The free wall at TUBS continued for 6 more years until 2014 when it was finally demolished to make way for a large condo building. 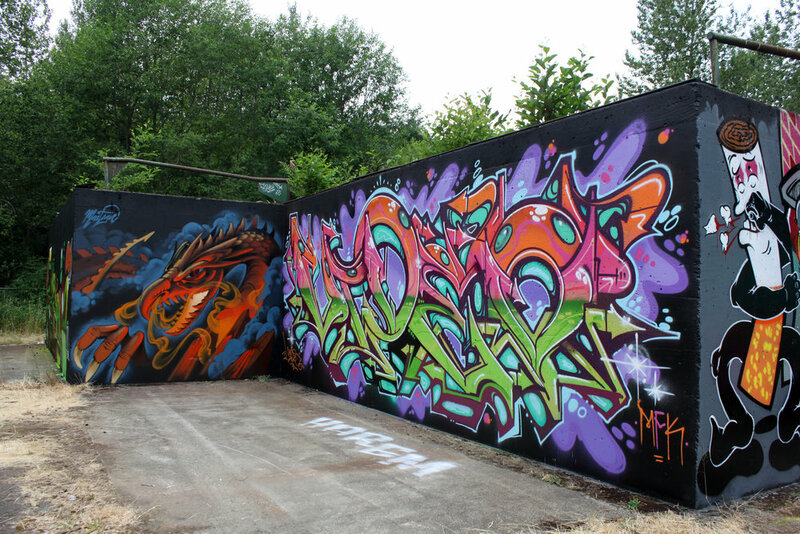 Like the SoDo Wall before it, the TUBS free wall was an important piece of Seattle's urban art history and unique when it comes to other cities in the U.S. For example, in neighboring Portland, OR a free wall like TUBS could never offically exist. While the City of Portland also defines graffiti as "unauthorized markings," it also requires a mural permit or waiver for any public art. So if a piece of art doesn't have a permit, the City of Portland can deem it as "graffiti" and force property owners to remove it regardless of whether or not the owner consented to the art in the first place.